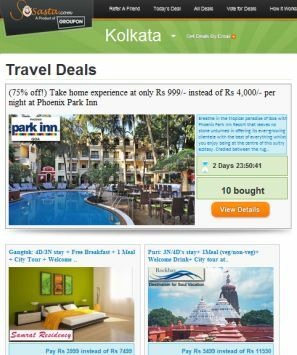 Groupon India (Sosasta.com) has launched domestic travel deals on the website. Sosasta.com currently serves users in 11 cities in India and features a daily deal on the best stuff to do, see, eat, and buy. "We look forward to featuring world-class merchants in the travel industry, mitigating the pinch of expensive travel. Users of Groupon India will find the perfect deals to build a vacation, whether within India or across the globe," said Ananya Bubna, MD, Groupon India, in a media release. The travel deals will be live on a nation-wide basis and will change daily. Deals have an expiry date for redemption. Users can purchase vouchers and redeem them on visiting the destination. Currently Groupon has partnered with Tata's chain of Ginger Hotels to offer a flat discount on room rates in 23 locations - Agartala, Ahmedabad, Chennai, Mysore, Delhi, Indore, Bangalore, Bhubaneshwar, Goa, Guwahati, Haridwar, Pantnagar, Jamshedpur, Ludhiana, Mangalore, Mysore, Nasik, Pondicherry, Pune, Surat, Trivandrum and Vadodara. The deal has witnessed 182 vouchers being sold at a ticket price of Rs 1250. Groupon.com was launched in 2008, and is headquartered in Chicago, USA. Read about how it entered India and its strategy for the year on Techcircle.in. Now, Groupon India is shifting its centre of operations from Kolkata to Bangalore. It has operations in Chennai, Delhi, Mumbai, Kolkata and Pune. India has seen a spurt in the number of daily deal sites with Rediff's Deal Ho Jaye, Times Internet (Indiatimes) launching Timesdeal.com. Other group buying sites in India are eBay India, Snapdeal.com, Dealsandyou.com, Mydala.com, Koovs.com, Dailydeal.in, Dealivore.com, Khojguru.com, Thekha.com, Scoopstr.com, 24Hoursloot.com, Masthideals.com, Snatchdeals.com, Lootmore.com, 30Sunday.com and Bindasbargain.com.